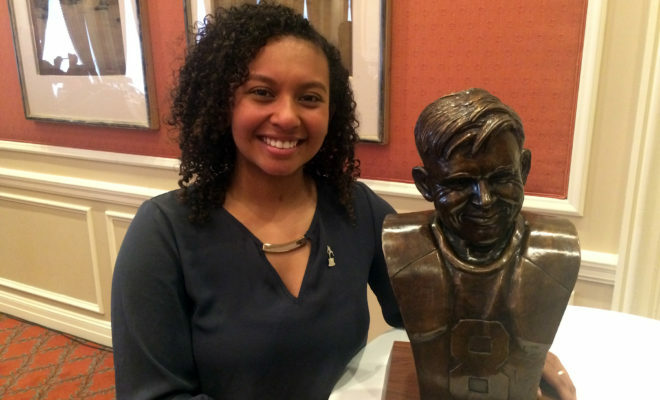 FORT WORTH, Texas (Jan. 23, 2018) – At its annual luncheon at The Fort Worth Club, the Davey O’Brien Foundation announced that Mikayla Wilson of Green B. Trimble Technical High School in Fort Worth is the recipient of the 32nd Annual Davey O’Brien High School Scholarship Award. Wilson is the first-ever winner from Trimble Tech, and is the second winner from the Fort Worth Independent School District (FWISD) in the past four years. Since the award’s inception in 1986, she is the sixth winner from the district. The $30,000 scholarship is partially underwritten by Higginbotham and Southwest Bank. Recipients of the Davey O’Brien High School Scholarship are chosen on the basis of scholastic achievements, community service, character, leadership and varsity sports participation. Wilson is ranked first in her class of 361 students at Trimble Tech with a 4.46 grade-point average on a 4.0 scale. She is a two-year President of the National Honor Society and a member of Key Club International. In addition, she has received major awards from the FWISD four times, as she was named a Superintendent Scholar and also collected three Ann Brannon Awards. As a junior, she secured the George Eastman Young Leaders Award. She also has been involved in the Natural Helpers Club and student council. Wilson is interested in pursing astrophysics. Wilson has competed on the Bulldogs’ varsity softball team since her freshman year, and is a three-time all-district performer heading into her senior season. She has earned District 7-5A first-team honors once and second-team accolades twice. She also participated in volleyball for three years. Wilson has been active in community service, most extensively with youth at the RD Evans Community Center. She also has been involved with Beat the Streets, Mobile Food Pantry, Optimist Club, Turkey Trot and Honored Hero Run. Since its inception in 1977, the Davey O’Brien Foundation has given away more than $1 million in scholarships and university grants to help high school and college athletes transform leadership on the field to leadership in life. The High School Scholarship, first awarded in 1986, applies to the college or university of the winner’s choice. Winners over the past decade have attended such schools as Columbia University, Harvard University, Johns Hopkins University, Massachusetts Institute of Technology, Princeton University, Rice University, Stanford University, Texas A&M University, Vanderbilt University and Yale University. The Foundation will also award a $2,500 scholarship to each of this year’s five other finalists: Sophie Isom (The Hockaday School), Ainsley McDonald-Boyer (Azle High School), Brandon Parrish (Joshua High School), Michael Smat (All Saints’ Episcopal School) and Mason Ward (Keller High School). Wilson will be honored Monday, Feb. 19, at the 41st Annual Davey O’Brien Awards Dinner alongside Davey O’Brien National Quarterback Award winner Baker Mayfield of Oklahoma.